So I guess there is a significant change in a girl’s life when her space also becomes… the Mr’s space. Well I loved my childhood bedroom. Infact I loved my teenage bedroom even more. It was the place I slept, the place I crafted, the place I read, the place I had friends over to, the place I decorated (constantly). All in all, it was my room. So sharing a bedroom long term, with the one you love also comes the fact it is a shared room. It’s a tad inappropriate to plaster every part of wall space with homemade collages adorning your favourite style icons. I love having pretty images around me, and I’ve tamed my poster mad obsession with delicate post card displays. Remember my bargain TKMaxx finds? Well since you last saw them, they’ve been painted the same duck egg blue as my pound chair, and are finally on the wall and in use. The card holder one is perfect for all my keepsake cards. The other one, I seem to have devoted to Beatrix Potter. The chandelier light shade I have had for some years now and was centre piece of my teenage bedroom, so it’s nice to have a piece of that back. And remember my recent Poundland find? Well this lantern is now hanging on the arch, I just love it. I’ve tried not to go to town with ‘over cluttering’ I mean it is a known fact I have too many things. I’ve finally got my entire collection of empty (yes empty) Anna Sui perfume bottles all in one place on display on top of my set of drawers. Décor wise I knew I wanted a feature wall, and chose this wallpaper by Super Fresco, we ended up needing two rolls in the end, but it was worth it. It also means my cats wallpaper fetish is strictly forbidden at all times. My desk area is constantly changing; I love adding things and will probably always be moving bits and pieces around. It’s nice to have those things I have cherished for so many years finally on display. You might also recognize a few other bits and pieces from that past year, like those oh so lovely butterfly tins. Wow, I'm rather jealous of your own little room! 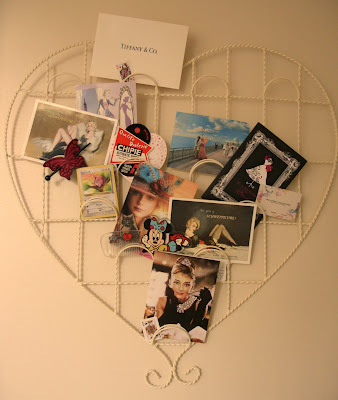 That heart-shaped memo holder thing? I bought one v.similar to that for my friend's wedding present (didn't cost me bloody £2.50 though!) - I love things like that, I wanted to keep it for myself! 2 and 3 are the best pictures in my oppinion this blue is very sweet!!! your room looks very nice! So pretty everything is so organized, love the chandelier. Oh you've done it beautifully. Every picture is a joy to look at. Such a gorgeous room - love the wallpaper! Where did you get the postcards on your pinboard? So cute, I would love my own little crafty space! oh it looks beautiful, i love duck egg blue and that wallpaper is so pretty!